Customer Relationship Management has become a critical tool for homebuilders and real estate developers to organize and analyze data. Those who use CRM have a distinct advantage over those still working within the confines of basic contact management systems or Excel-based spreadsheets. CRM allows sales people and managers to track the activities that lead to sales, and make informed decisions about sales and marketing campaigns. With in-depth reporting options, a CRM system custom built for new home sales allows teams to track, in detail, sales performance. Here are a few examples of reports offered by lead management and marketing automation system Lasso CRM that show which data can and should be closely monitored. This is a summary of the activities completed for each registrant during a specific time period. 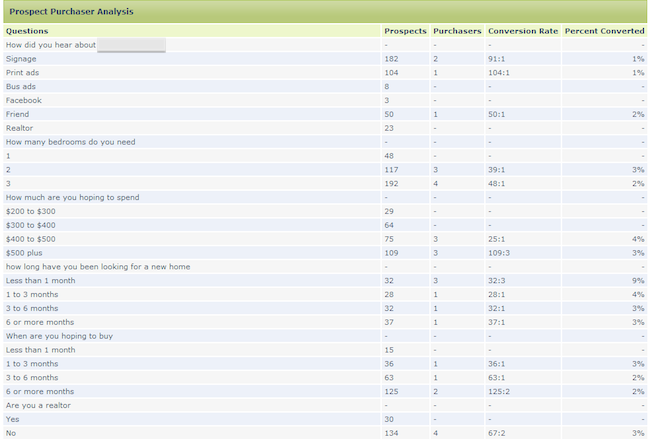 You can easily determine which activities led to a Purchaser status. This could be a combination of phone calls, emails, mass mailings, return visits, appointments, etc. – tracked in such a way to see success patterns. This report will closely follow the Sales Processes that you have already set up in your system, so you can adjust them as you see which steps are working. This report is similar to the Project Activity Report, but instead of tracking completed activities, it monitors history types for each registration during a period of time. The History feature tracks all correspondence with a registrant, so the report shows the communication details that led to a Purchaser status. It’s an effective method to understand what led to a prospect’s moment of decision. Builders and developers (and for that matter, businesses in general) who use CRM to its maximum capability are often steps ahead of their competition in terms of sales and customer insight. CRM allows you to see success patterns, fine-tune sales processes, and ultimately, gain a keen understanding what it takes to be profitable.